I Make Coffee for a Living – sorta. Interestingly, over the last couple of days, I’ve had a few discussions about what I do for a living. I want my response to be as simple as “I make really rad coffee for a living”. Then today I was meeting with a couple of young, aspiring entrepreneurs. When I asked then what they wanted to do they said “we want to have a cafe just like Tazza D’Oro and make coffee for a living”. So, I said to them that sounds awesome, but here is what I really do – I manage, taste, market, crunch numbers, write blogs, shop, hire, fire, inspire, sweep, clean, talk with vendors, find new product, type up menus, cook, pay the bills, sign checks, constantly have equipment repaired, problem solve, and constantly evaluate the business THEN some days I get to brew coffee and make espresso. However, at the end of the day I make sure we produce really rad coffee and espresso. 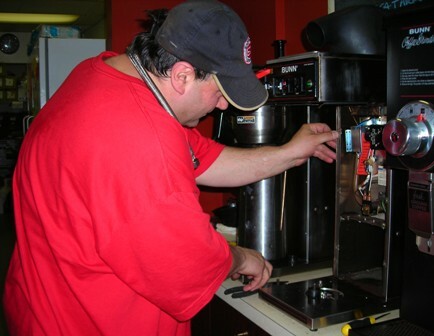 This is Todd Michael from Espresso D’Milan tweaking our coffee brewers this morning and doing some preventative maintenance. After lots of discussion, lots of techie geek stuff and one or two calls to Batdorf and Bronson. Yep, I made some coffee. BTW, Todd Michael has some awesome gear in his toolbox. Now, that’s what I call a cool j.o.b.! And this is what we try to explain to solicitors sometimes when they "just want 15 minutes of our time"... we're just really really busy... all the time.